Can you imagine 110 times the amount of garbage as in this picture? Well, this is what Hastings-on-Hudson school district has not generated in the past year thanks the robust We Future Cycle recycling program it adopted last year. About 22 tons. Thanks to the endless energy and support of Maureen Carabello, Treasurer, as well as the two head custodians in the elementary school and the middle/high school Hastings can look proudly upon major accomplishments. 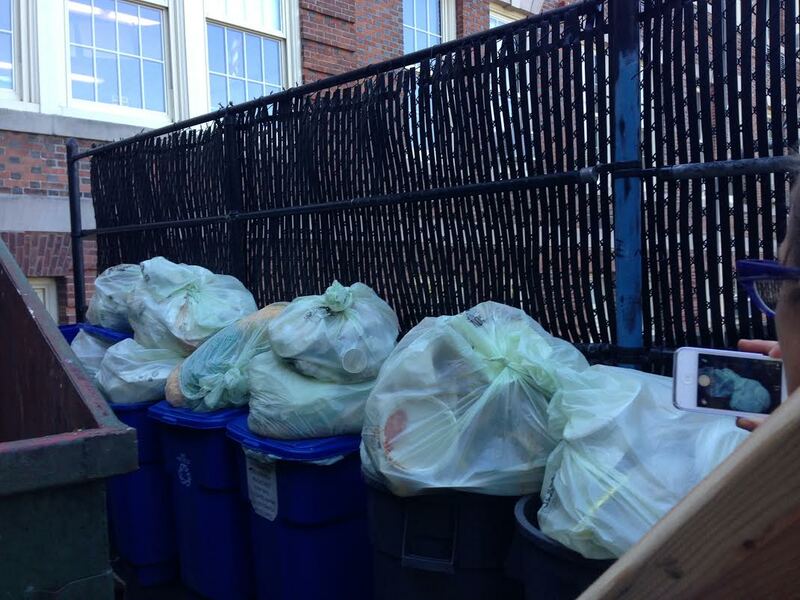 Both buildings reduced their garbage so significantly that they reduced the number of dumpster by 50% and were able to renegotiate a $2000.00 reduction in their pick up cost. Custodial staff was also able to reduce their plastic bag usage and purchases by 50% which is an expense often overlooked. Truly an astonishing first year results. Hats off to Hastings-on-Hudson. We Future Cycle is proud to be featured on FiOS 1 News by reporter Christina Chiarelli, who was on site at Hastings’ Hillside Elementary School. Ms. Chiarelli spoke with the school’s head custodian, George Giannone, aide Kim Osborne, and many students about how the program has dramatically reduced lunchroom waste. As well, interviews with the students’ demonstrated how much they have learned about recycling from participating in the program! Hands-on recycling and composting give kids a tangible understanding of how their actions have an impact on the environment. 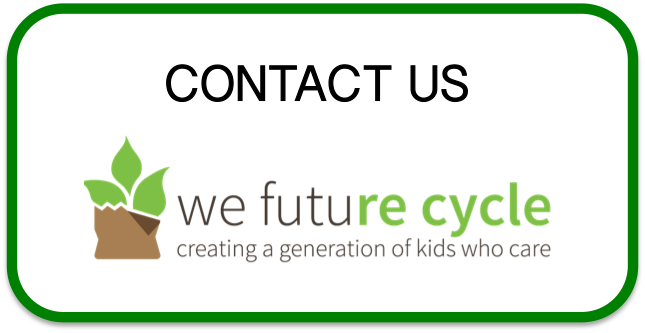 Sean Adams of WCBS radio recently covered the We Future Cycle implementation at Hastings-on-Hudson schools, featuring We Future Cycle founder Anna Giordano, Hastings’ Hillside Elementary School Assistant Principal Farid Johnson, Facilities Director George Prine, and Food Service Director Alan Levin. Read and listen to the WCBS AM 880 story here. 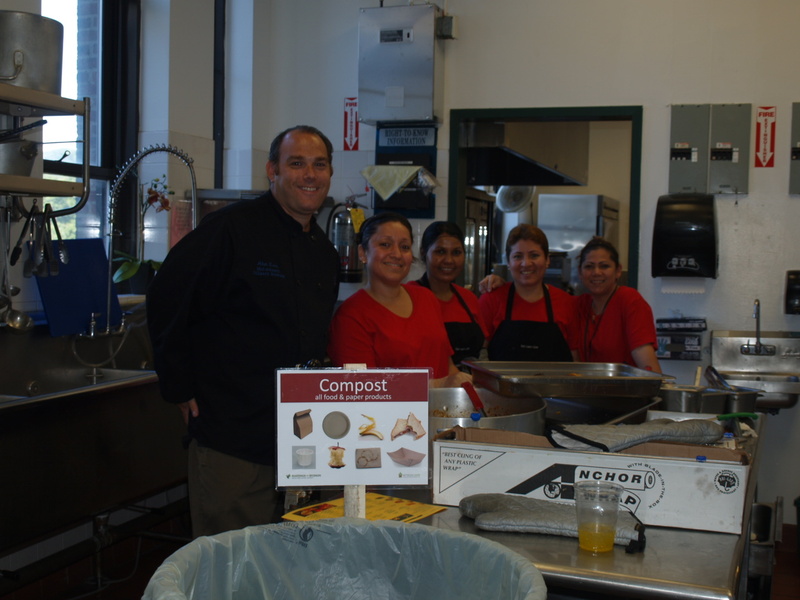 Hastings-on-Hudson school district has changed Food service providers and the new manager Alan Levin is very supportive of the school’s recycling initiative. He worked extensively with We Future Cycle and his staff to find the perfect set up in the kitchen to allow for proper source separation. and all commingled like cans, bottles, salad dressing containers. This reduces the kitchen waste from 5 bags per day to really just two handful, because only sanitary gloves and soiled soft plastic does not fit into the above mentioned categories. Mr Levin has shown great support and within days has been able to organize the kitchen to follow the new guidelines properly. 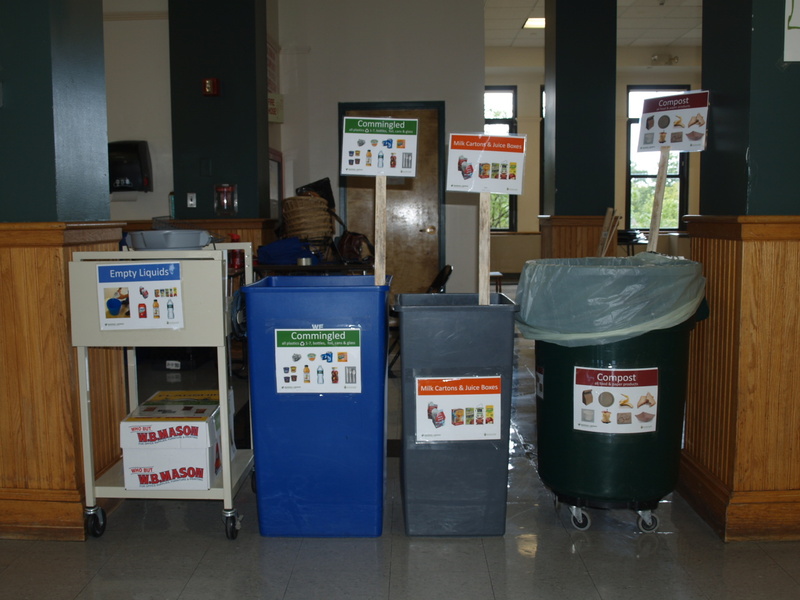 Hastings-on-Hudson has launched its extensive recycling program and is looking proudly at a 90% reduction of waste from its lunchrooms as well as a significant reduction in the building. We Future Cycle helped set up the building to allow for source separation into paper, commingled and food waste recycling. Left as trash is really only plastic baggies and some other soiled things that do not fit into the above recycling groups. 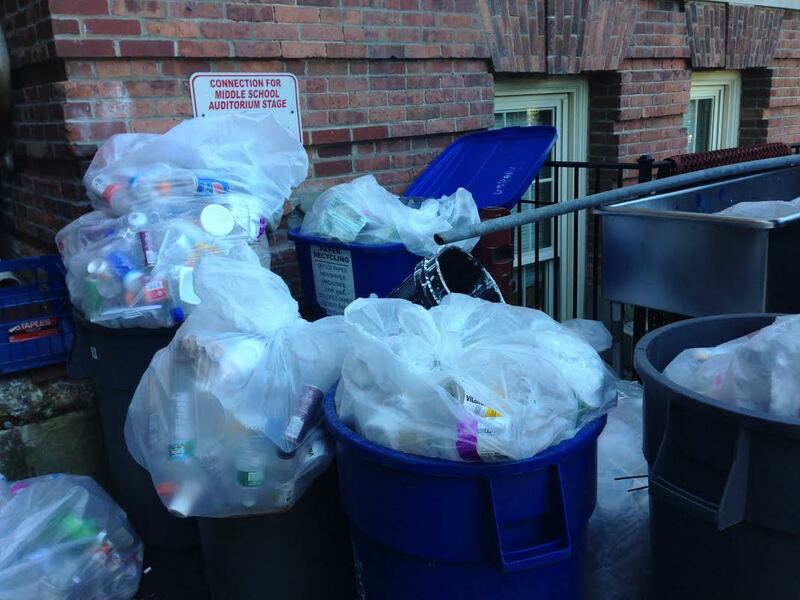 George Prine, the Director of Facilities said that he is amazed as to how little garbage there is left. 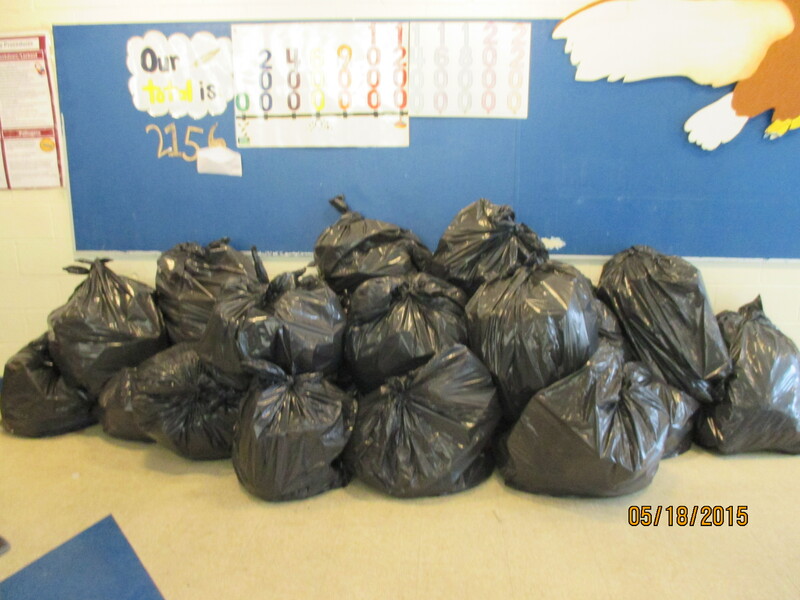 The Farragut Avenue building, which hosts the High and Middleschool of around 800 students usually generated 17 bags of loosely filled garbage bags just from the lunchroom. With the recycling station in place, it is now generating 4 bags going into food composting, 1 bag going into commingled recycling, and 1 small bag as trash. That is it. This will eventually translate into significant savings for the district in waste management, as about 70 bags of garbage per day are not generated. Instead these materials are source separated and fed into the existing recycling streams. This saves money, and is also much better for the environment. And we are creating a generation of Hastings students that know what source separation can do and how easy it is. Soon it will be the new normal.